Time to show our weekend project. 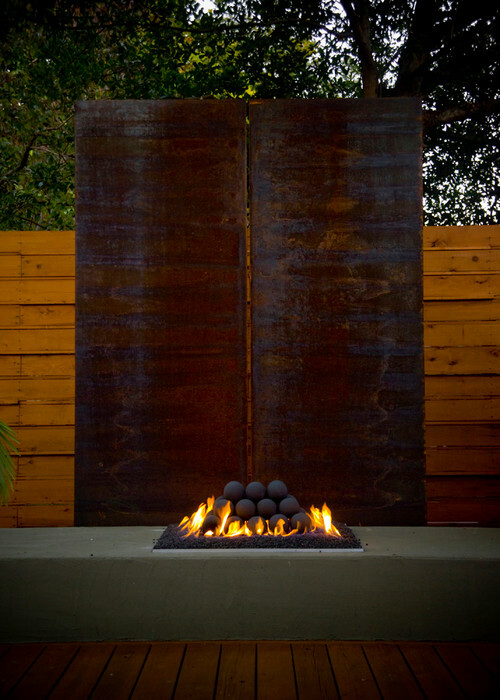 A galvanized tank turned outdoor gas fire pit. From the get go, we knew we wanted a gas fire pit (no flying embers starting a fire, please). After searching Houzz for inspiration, we decided we liked a longer, linear style. Modern Landscape by Menlo Park Landscape Architects & Designers Keith Willig Landscape Services, Inc. Figuring out the housing was tricky. Ben didn’t want a heavy concrete piece and wood wouldn’t work. Finding a huge metal bin around here isn’t easy, unless you want a water/stock tank. So a six by two by one foot deep galvanized stock tank solved our problems. To get started, Ben ran a flexible gas line through a rigid pipe. Luckily, our furnace and water heater are on the back side of the house, so punching through wasn’t terribly difficult. Then he drilled a hole in the side of the tank for the gas to come in and a few more in the bottom for water drainage. 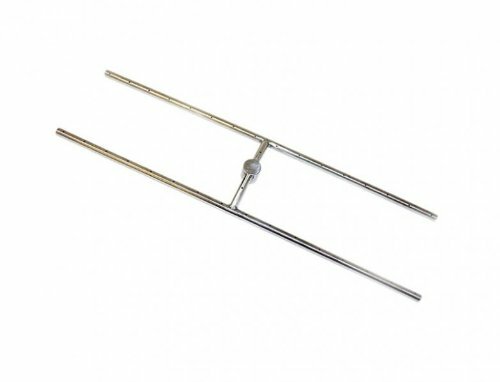 H burner kits, like this one, are available online, ready for install. After talking to a guy at a local fireplace store, he suggested Ben make his own using black pipe. Turns out, this way cost under 50 bucks and is completely customizable. With the end caps still off, Ben drilled holes. Ours are all about 2 inches apart, the whole length. And here it is, before adding decorative top rocks. There’s an exposed valve on one end, but a main shut off valve in the garage. That way little hands can’t turn on the gas outside. That Tarter sticker is gone now, too. Not that I didn’t love the look. Haha. Having this valve makes the flame height adjustable. Super low for ambiance or high for warmth. Until we decide on the top layer, we put a layer of limestone on. Of course, we’re still cleaning up and fixing the damage from the storm, so things aren’t looking finised…yet. The waterfall is clean and functional again and there’s a drainage trench along the hill to hopefully channel water down. Muddy footprints cover the deck and we’re waiting for another truckload of limestone to cover the dirt and mud. But we’re happy with any and all progress. Especially when it’s fun and s’mores are involved. Oh yes, we put the new fire pit to the test the day we finished it. So, what do you think? 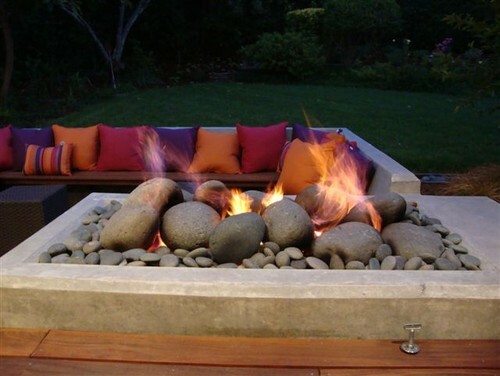 Do you have an outdoor fire pit? Or top rock suggestions? P.S. We didn’t win at Apartment Therapy, but really, really appreciate your support and favorites. Sherry, you’re the lucky winner of a custom Sit and Stay pillow set. WHAAAAAT!! I swear every project is a stunner! I love it! Are you going to leave the tank exposed or build some kind of frame around it? I’m amazed at your handiwork! For now, we’re going to leave it exposed. If we want to cover around it down the road, it shouldn’t be too hard. I LOVE this. I even showed my hubby so he can make us one. I want to cover mine with the tumbled river rock. Hubby says this is going to be his next project. I’m so glad you love it. It was a fun project and we’re so happy to enjoy it. 🙂 Please share your fire pit when you’re done. Love it … this my weekend project!! What size drill bit did you use for the burner holes? If I remember correctly, it’s was a 1/8 inch bit. Start out small and see how it works. You can always add more or make them larger. Have fun with this project! Hi looks awesome! I have been wanting to do this, what did you use on the threads to seal the connections? What size are the holes you drilled for the flames?… Does the size of the holes affect the flames? Ooh, good questions! Honestly, we really love it. Definitely drill holes in the bottom of your pit for rain to drain out. You might want to drill more holes in the H pipe, but I’d recommend starting with our spacing. It’s easy enough to drill more holes. I really want to change out the rock we have, to something darker/black because the lighter limestone rocks look burned. Also, we have a lot of limestone around this pit so a different color would help break things up. Of course that’s personal preference, but we’re really happy with the function of it, so as far as the tutorial goes, I don’t think I’d change anything. 🙂 Happy DIYing! I’d love to see your end product, if you don’t mind sharing photos. Hi Amanda ,I’m just wondering how you set up your venturi, if you have any pics that would be helpful as well ,great idea with the bin. I was just giving a bunch of bamboo which I planted and the fire pit is next. I have decided to build a long pit instead of round. Thanks for posting your project it helps a lot. After the fire pit I’ll be building the waterfall, outdoor cook top and the outdoor movie screen . Ohen I have it all finished this summer I thought I would invite all my neighbors over for monthly movie nights. Could you comment on further details, such as what regulator, and hole size you drilled into what size of black pipe. these 3 things that are really important in such a pit to work well first time out of the gate. Thank you. What did you use for the gas valve/ regulator ?